Standing on the street, looking straight up into the Manhattan sky. This is one approach to eliminating the clutter (signs, power lines, traffic lights ...) of the city. Rows of clouds let rays of light through, causing small areas of brightness in the Atlantic Ocean off the coast of Acadia National Park. A Golden Retriever sits among the green ferns and an orange mushroom. Did you know that getting a dog to sit still for a 1/8 second exposure is not easy? Though there are a lot of clues as to what specifically this kid is working on, I couldn't tell you what it is. The 1/13 second exposure is too long for most people shots. This girl is being very still by request. Horseshoe Bend, Grand Canyon was one of the top photography locations on my Grand Tour list. This shot was taken in late morning - when the sun lights the Colorado River in the canyon below. Horseshoe Bend begs for a 17mm or wider focal length (full frame equivalent) lens - unless shooting a panorama. In this example, the Canon TS-E 17mm lens allowed me to capture a much-wider-than-17mm view - in high resolution. Two vertically-oriented, oppositely-shifted shots were combined in Photoshop to create this ultra-wide view of Horseshoe Bend. One foot of my tripod was precariously positioned on the very edge of the cliff - and has been cloned out of the final picture. A skyscraper reflects in the windows of another. Using the maximum tilt setting for this tilt-shift lens leaves the subject sharp and the surroundings strongly blurred - very strongly blurred for a 17mm f/4 image. The viewer's eye will be drawn to the in-focus subject. This location along Swiftcurrent Creek is just downstream (east) of the bridge to the Lodge at Swiftcurrent Lake. The low cut in the mountains at this location allows sight of the early AM sky lighting up. Shooting sunrises is often best done before the sun actually rises. After sunrise, turn to the side and even directly away from the sun. Vice versa at sunset. This is an HDR image. One exposure was used for the bright sky and another longer exposure was used to pull detail out of the foreground shadows - and to add motion blur to the water. While this girl is not tall, using the maximum lens shift setting gives her the appearance of being so. The neck and relatively tiny head of a dinosaur reach up into the ornate ceiling of the Natural History Museum's main entrance in New York City. This pair of pink hibicus flowers demonstrate the close-up capabilities of the Canon TS-E 17mm f/4 L Lens. The full lens tilt settings of the TS-E 17mm lens were used for this shot. Significant background blur is one of the results. With 30 second exposures, it was not hard to be capturing this amazing St Mary Lake, Glacier National Park scene simultaneously with two camera setups - doubling my take-home. 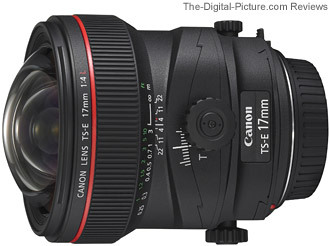 The Canon TS-E 17mm f/4 L Lens was used for capturing the ultrawide angle of view while a Canon EF 24-105mm f/4 L IS USM Lens captured tighter framing. A slight amount of lens tilt was used for this shot - to keep the close foreground and distant background all in focus. Maximum perspective distortion over-correction (lens shift) results in an odd looking house. Maximum perspective distortion correction (lens shift) was used for this photo. Obviously, the TS-E 17 L cannot make the lines of a building this tall straight up and down when positioned at ground level. Pointing an ultra-wide angle lens upward will emphasize the diminishing line effect - causing these tall pines to slope noticeably inward while framing the large granite alls of Cathedral Rocks. I kept a clean, grass-only bottom edge of the frame and similarly, only sky and clouds intersect the top of the frame. This is a cropped two-shot panorama of Horseshoe Bend, Grand Canyon taken using the shift feature of the Canon TS-E 17mm f/4 L Lens in horizontal orientation. Bright green ferns stand out in this burned-out forest in Yosemite National Park. The lighting was not favorable for grand landscape photography this morning, but the very overcast sky was ideal for photographing the forest floor. Late May, after an unusually high snow pack, is not a good time to shoot reflections at Yosemite National Park. The Merced River was definitely not mirror-like. I was able to find this pond to get a reflective shot of the granite walls of Cathedral Rocks. I was balancing on a log with my tripod in a couple of feet of water to make this image. Driving to Glacier Point is a much easier way to see Nevada Falls than hiking Mist Trail to do the same. However, the latter will give you much more exercise. For this shot, I aligned the silhouetted pine tree trunks so that Nevada Falls was framed and the bank of clouds were also framed. The shaded foreground provides a base for the composition. This image was cropped for a wide aspect ratio. The Many Glacier Hotel can be seen just above the foreground rock in this image. Early morning light reaches the peak of Mt Grinnell long before reaching the Swiftcurrent Lake and valleys below. The road, if it even qualifies for that title, leading to this beach in Kekaha Kai State Park (Big Island, HI) is very rough. A 4x4 is recommended. The rough ride is very adequately rewarded with a beautiful beach and an unobstructed view of the setting sun. This image is an HDR composition of two exposures. The brighter exposure brings out the details of the bony beach.